"Lisa Leslie Rand, Westbrook College, Class of 1977"
Westbrook College student Lisa Leslie Rand, Class of 1977, was a Medical Assistant major and lived in McDougall Hall. For her senior class candid photo, which appeared in the 1977 Tower Yearbook, she wore dark, wide-legged pants and a matching v-neck sweater vest with a white dress shirt with wide collar. Her hair was short, parted in the middle, and feathered back on the sides. Lisa sits on her dorm room bed, with hands crossed in her lap. 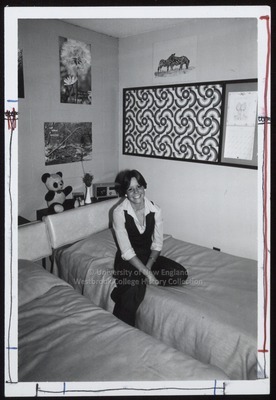 The cinder brick wall of her dormitory room displays a psychedelic poster and seasonal artwork. At the head of her bed is a stuffed panda bear, a clock radio and a vase of dried flowers.